- Moulded out of superior grades of Polyethylene. - Seamless and smooth inside-out. 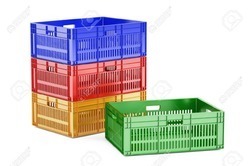 We are a leader in manufacturing and supplying of Vegetable Crates. We manufacture and supply Plastic Crates in a large quantity to our client. O.D ( in mm ) : 400 x 320 x 250 Ht. I.D ( in mm ) : 360 x 285 x 245 Ht.